Nana’s Golabki is the ultimate comfort food! 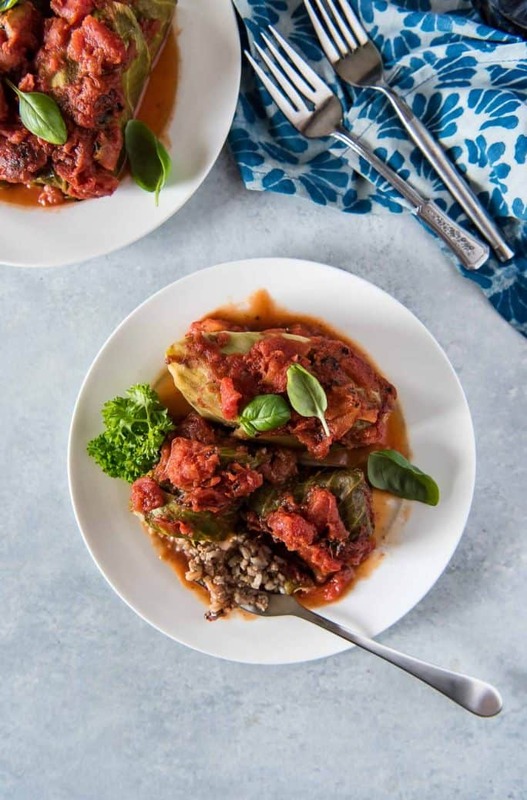 These Polish Stuffed Cabbage Rolls are mostly traditional – ground beef and rice wrapped and baked in soft cabbage leaves, but with a healthy surprise ingredient: mushrooms! What’s in a name? Especially one in another language? 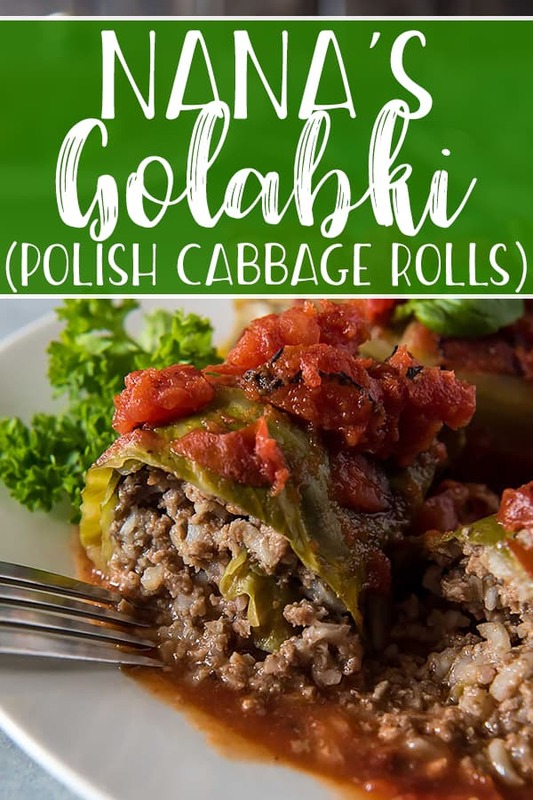 I grew up eating and loving my Nana’s Polish stuffed cabbage rolls, but I never could get the pronunciation quite right. Gołąbki was goo-woomp-key to me (which is actually pretty close to how it’s actually pronounced)…but I’ve seen this traditional dish spelled every which way, from galumpki and golumpki to hulupki. Phonics is a funny thing. Now that we’ve had our English lesson for the day, let’s talk about the actual food. 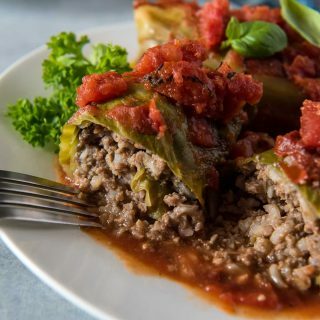 These cabbage rolls made an appearance on our dinner table about once a month. I distinctly remember the frequency because this was one of my favorite meals, and every time we sat down to dig in, I’d whine about why we didn’t have them more often. To say they’re a bit time consuming would be accurate. 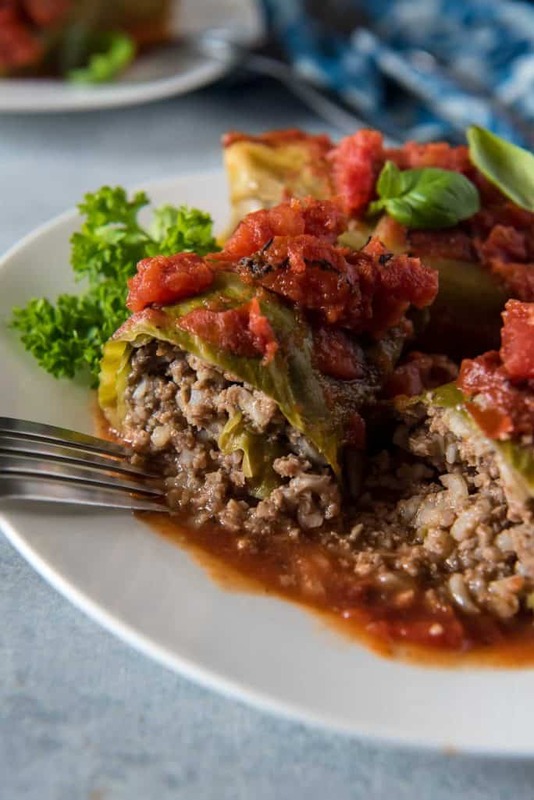 They’re done in a little over 2 hours, which isn’t terrible since most of that is oven time – but rolling the filling in the steamed cabbage leaves can be a little trying for even an experienced home cook. The key to making the process easier is having a perfect blend of ingredients in your meat and rice-based filling…and I think I’ve finally mastered it in this golabki recipe! I admit, I fiddled with Nana’s recipe a little bit, but only by making a tiny substitution. Instead of using an entire pound of ground beef and skipping the traditional ground pork…I mixed in some finely chopped mushrooms. I’m not in the habit of ruining the nostalgia of a traditional dinner, but just hear me out. Nana’s prep was simple, but involved pre-cooking the meat and onions. Spooning the unruly mix into the cabbage and fighting to keep it inside while she rolled the leaves…no wonder she hated making them. When I was experimenting with this recipe adaptation, I decided a meatball-type filling would be easier to handle. The mushrooms came into play because, honestly, Abe and I are just really obsessed with them. We have a pint of Portobellos in our fridge at all times and love to add them to frittatas and pizza. Plus, I’ve been using them in our burgers and chili for years to reduce our sodium intake (mushrooms are low in sodium, and we both have a family history of high cholesterol). We’re taking the Blenditarian Pledge this year, mainly for health reasons. Abe has high blood pressure, and with both of us trying to eat better and shed some pounds, the first thing we’ve done is cut back on salt. 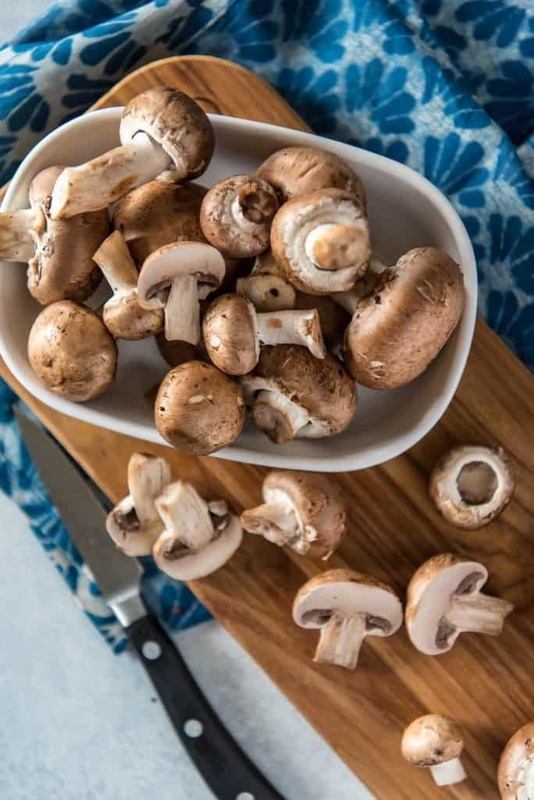 Mushrooms are rich in umami (the “fifth” taste), meaning enhanced flavors with no extra salt – making them a great ingredient to use more often in any recipe with meat. Now, my husband is a salt fiend. He’s also always my first critic when I’m developing a new recipe. More often than not I hear, “It needs more salt, babe.” Sometimes before he even takes the first bite. This golabki recipe is already fairly healthy, most of its calories coming from the rice and ground beef, depending on what type you use. By making these with lean ground beef, and replacing only 1/2 pound of it with 6 ounces of chopped mushrooms, you’re reducing calories and saturated fat. At the same time, you’re adding extra vitamin D, vitamin B, potassium, and antioxidants to your meal. If you still need a bit more convincing, think about this. Golabki is already considered a peasant dish. Cabbage is dirt cheap, and so is rice. Meat can get pretty expensive, so if you’re on a budget, adding inexpensive mushrooms will stretch your recipe by adding bulk and volume. More Delicious Recipes from Nana’s Cookbook! Nana's Golabki is the ultimate comfort food! 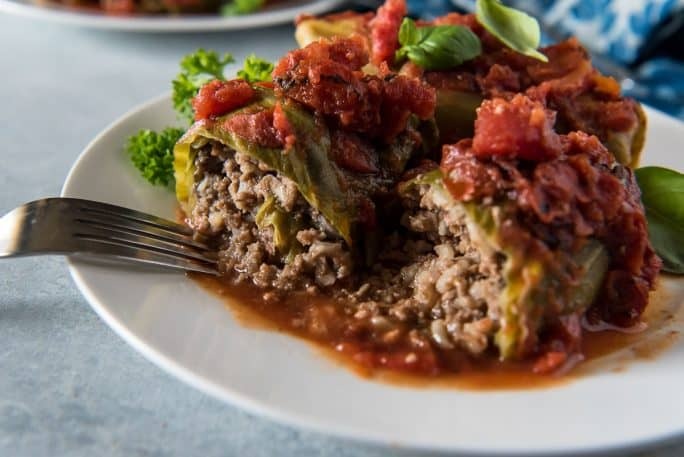 These Polish Stuffed Cabbage Rolls are mostly traditional - ground beef, pork, and rice wrapped and baked in soft cabbage leaves, but with a healthy surprise ingredient: mushrooms! Bring a large saucepan of lightly salted water to a boil. Add the head of cabbage and cook for 2-4 minutes or until softened. Drain, then carefully cut and remove the outer leaves. If necessary, add the inner head back into the water and cook for ad additional 2-3 minutes until most of the leaves are removable. In a medium mixing bowl, combine the ground beef, mushrooms, onion, cooked rice, egg, 1/2 cup tomato sauce, garlic, 1 tablespoon Worcestershire sauce, and salt and pepper to taste. Mix thoroughly. Cut a 'V' around the thick vein of ten of the sturdiest cabbage leaves and remove. 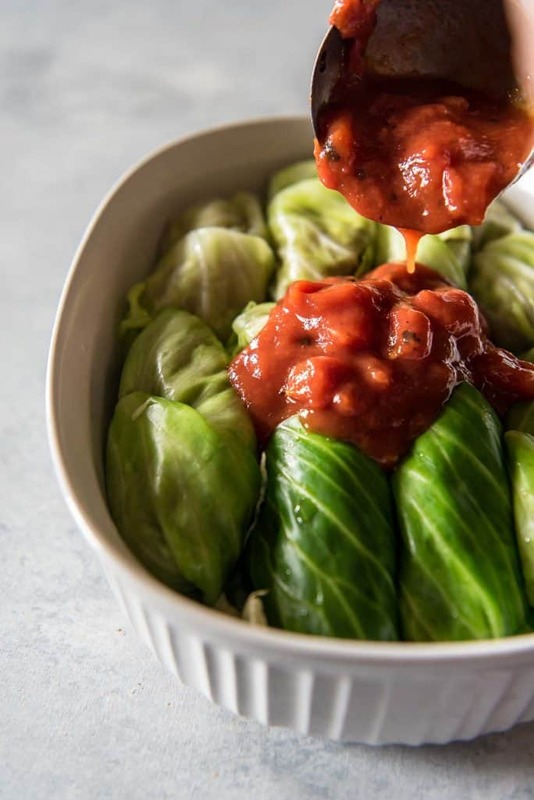 Reserve 4 of the largest leftover leaves, then chop the remaining cabbage and place it in an even layer on the bottom of a large casserole dish. Slightly overlap the cut ends of the prepared cabbage leaves to form a flat surface. Spoon a generous 1/4 cup of the beef mixture on top of the overlapped end, then tuck in the sides and roll up. Place seam side down on top of the bed of shredded cabbage. Repeat with remaining leaves. In a separate bowl, combine the remaining tomato sauce, diced tomatoes, lemon juice, and brown sugar. Whisk to combine, taste, then season with salt and pepper as desired. Pour evenly over the cabbage rolls. Layer the large remaining cabbage leaves over the rolls and bake for 1 hours. Remove the top leaves (which will be pretty burned) and continue to bake for another 30 minutes, or until rolls are tender. 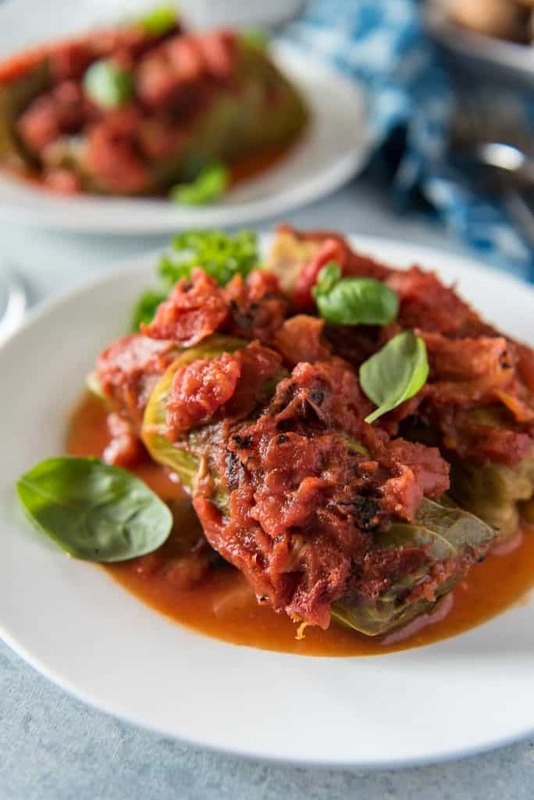 PIN MY NANA’S GOLABKI (POLISH STUFFED CABBAGE ROLLS) FOR LATER! You seriously made my day, Tania! 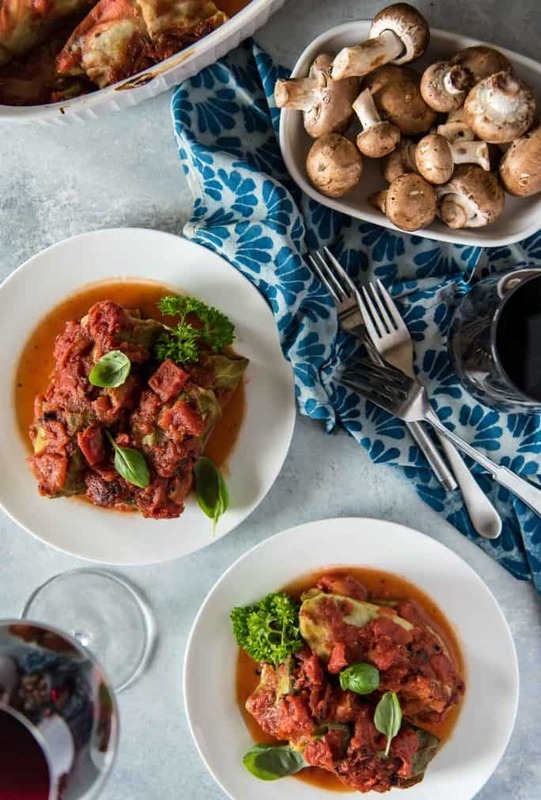 I love being able to connect with people over our mutual love of food – especially the nostalgic kind! I hope the flavors of these ring true to what you remember! Thank you so much for stopping by! Yep – Nana never would have thought to use mushrooms either – she wasn’t a fan! They are delicious potluck meals, you’re right about that! Great recipe, this Polish girl approves! !